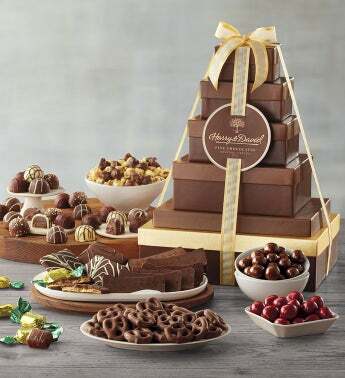 The chocolate aficionado on your list will revel in this gift brimming with favorites handcrafted in Southern Oregon. Includes dark chocolate Moose Munch® Premium Popcorn, indulgent chocolate cherries, and a pound of best-selling chocolate truffles from our candy kitchen. Delectable chocolate decadence cake from our bakery rounds out the assortment, and it's all topped with a hand-tied bow.